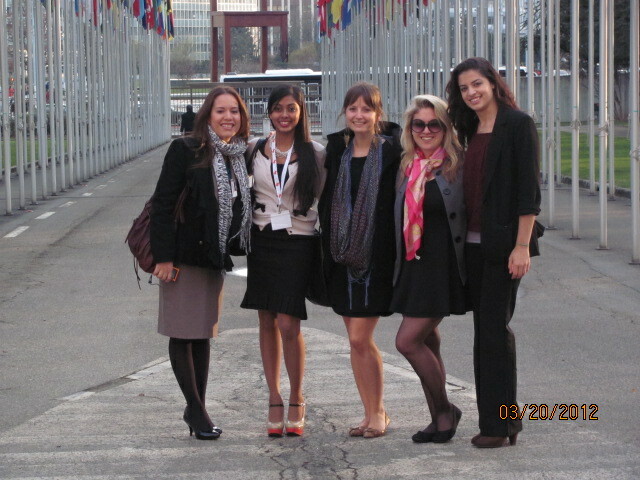 Kimberly Alonso '13, head delegate Katie James '14 and Abby Lee '13 (from right to left) stand outside the UN's Palais des Nations in Geneva, with head delegate Krupa Patel '12 and Aydde Martinez '07, who assisted with Pace University delegation to the Geneva International Model United Nations conference. As a head delegate of the Pace University New York City Model United Nations program, Katie James ’14, of Farmingdale, Long Island, New York, acts as a leader, co-teacher and mentor to other student participants. She has won multiple awards for her participation in simulations of the UN and other international organizations, including University of Pennsylvania Model UN (UPMUNC), National Model UN (NMUN) in both New York City and Washington DC and the NMUN specialized conference of Asia-Pacific Economic Cooperation (APEC). However, as a participant at this week’s Geneva International Model UN (GIMUN) conference in Switzerland, she has found herself challenged and stretched in new ways. Representing CARE International in a simulation of the executive board of the UN Development Programme (UNDP), Unlike her previous Model UN experiences, she was representing an NGO, rather than a country, which meant she had to rely on persuasion and consensus-building to persuade member states to adopt CARE’s agenda. Two other Pace students, Kimberly Alonso ’13 and Abby Lee ’13, also participated in the UNDP simulation. “As a communication major, it was fascinating to see how important mass media has become to process of democratization — we included the right to communication in the resolution we passed in the committee,” said Kimberly, a junior who also has a minor in political science, represented Japan, one of UNDP’s primary donors. From Springfield, New Jersey, last fall she represented the Philippines at NMUN DC, as part of a delegation that received an “Honorable Mention” award. Kimberly is an intern in the office of New York City public advocate Bill DeBlasio as well as Bigfoot Communications, a social media firm. 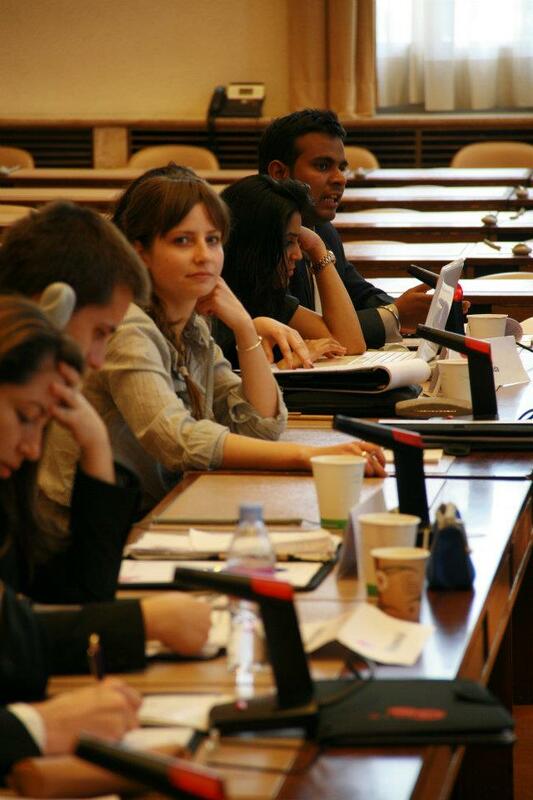 Abby Lee '13 (facing camera) listens to deliberations in a simulation of decisionmaking within the UN Development Program at the 2012 Geneva International Model UN conference. Photo by Francis Mayne for GIMUN. “I find the topics for Model UN really interesting because I like to try and keep a global perspective. Our world is becoming smaller every day and therefore communication between nations becomes increasingly more important,” said Abby, a junior political science major from Westford, Massachussetts, who also represented a significant contributor to UNDP: Sweden. Abby represented the United Kingdom in the Commission on the Status of Women (CSW) at the 2011 NMUN DC and was recognized with a “Distinguished Delegation” group award. Abby, Kimberly and Katie are among 11 Pace NYC students attending the prestigious 2012 GIMUN conference in the auspicious Palais des Nations – former League of Nations headquarters and current location of the UN Office at Geneva. The theme of the 2012 conference is “Achieving Dialogue and Development through Cultural Diversity.” Participants hail from 49 countries, and committee sessions are simultaneously translated between French and English. This entry was posted in News and tagged Abby Lee, Africa, Arab Spring, CARE, CARE International, Communication Studies, DC, Democratization, Distinguished Delegation, Dyson College, Dyson College of Arts and Sciences, Geneva, Geneva International Model United Nations, GIMUN, GOAL, History, Japan, Katie James, Kimberly Alonso, mass media, Model United Nations, MUN, National Model United Nations, New York City, NGO, NMUN, Pace, Pace University, Peace and Justice Studies, Pfozheimer Honors College, Political Science, poverty, Sweden, UN Development Programme, UN General Assembly, UN Office in Geneva, UNDP, United Nations, UNOG, Washington DC. Bookmark the permalink.